Every gummy candy lover has had these! Gummy fried eggs are sure to put smiles on faces or trick those who aren’t expecting a gummy candy egg on their plate. 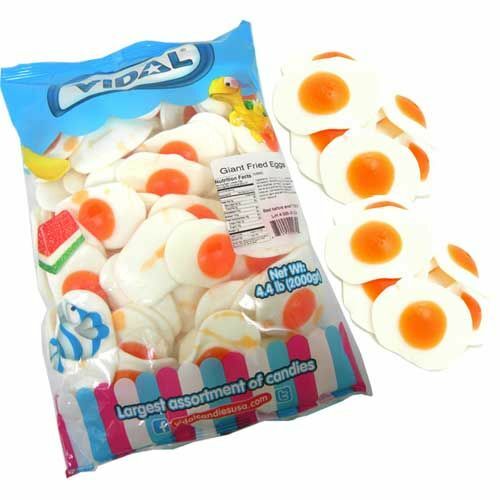 This bag of gummy candy in bulk contains 86 large fried eggs for a sweet addition to breakfast or a funny snack during the day. Those who love novelty candy will also love this gift. Pour your orange juice, fry up some bacon, and have a gummy fried egg for a well-balanced breakfast! This novelty candy bag weighs around 4.5lbs when shipped. Have everyone’s favorite gummy candy in bulk with one of our wholesale orders! See how you can qualify by visiting our Wholesale page.